Sales productivity: what has changed and how to overcome the challenge? To increase Sales productivity, we need a continuous stream of knowledge and experience sharing. In his blogpost on sales productivity and competency, The Value Shift CEO Dave Fitzgerald discusses the most important reasons for the ongoing decline of quota attainment. And we also find overwhelming evidence at our prospects and customers, that a lack of knowledge and experience are major challenges to overcome. So let’s have a look at the numbers first. CSO’s yearly study on quota attainment shows a growing problem. Because the number of companies achieving their revenue plans has decreased. And the number of salespeople making quota is even worse. It has declined to 58.1%, according to Jim Dickie at CSO Insights. For over 25 years, people have been looking at sales productivity as the combination of efficiency and effectiveness of their activities. This has been reiterated in a Miller Heiman blogpost from 2014. That definition of the sales productivity challenge might be useful to create awareness in the sales community. But it does not actually improve results. For far too long sales training and methodology companies have dominated the discussion. They tend to link this challenge to a need for more training and for cloning the practices of top performers. Resulting in an annual spend of $24 billion in sales training in the US alone, according to ASTD. Let’s bury the past and analyse the current situation. And come up with strategies that actually work in today’s competitive selling environment. Today, almost everybody agrees that customers are better informed and no longer accept being sold to. Sales has been able to cover up their lack of customer knowledge by explaining the features and benefits of their offering – preferably supported by demos. Customers settled for that way of interaction with sales because they had no alternative. Yet, in today’s market, people are able to educate themselves without the help of a sales rep. This has revealed the ‘real’ problem of sales teams: the ability to add value in the sales conversation. According to research by CSO Insights, 82% of senior executives indicated that content is a significant driver to their buying decision. As a result, content production increased dramatically in the recent years. And some vendors and analysts are claiming that content marketing is taking over from sales. Yet, the 2015 B2B buyers study by SiriusDecisions proves that content marketing hasn’t solved the problem of decreasing quota attainment. And besides that, they reveal that there is an almost 50-50 divide between “digital” and sales interactions. These numbers are almost independent of the buying cycle complexity and the stage in the buying cycle as shown in figure 3. So let’s make absolutely clear here, that content marketing is important but doesn’t replace sales. In addition, we need to kill a second misconception, that the buyer is forcing sales reps to enter only at the end of his buying cycle. Moreover, let’s stop using the CEB number indicating that 57% of the buying cycle is already done before salespeople are involved. What we need are meaningful conversations. No matter if the conversation occurs via human interaction or non-human engagement. And as long as buyers find the answers they are looking for throughout their buying cycle. Does this mean that investment in sales content and training is no longer effective? On the contrary, both are more important than ever. It is more difficult to train sales people on business knowledge and industry expertise than it is to train them on product related knowledge. This calls for additional conversational selling skills as well. 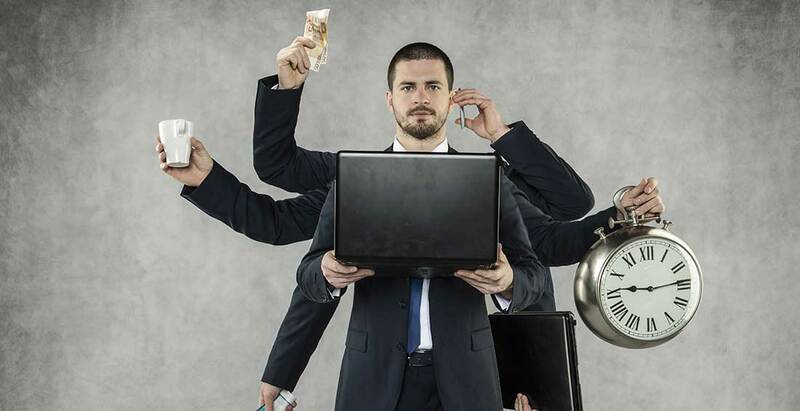 What is all of this telling us as to how to overcome the sales productivity challenge? Sales leaders need to initiate strategies to increase a sales rep’ ability to add value to the buyer/seller conversation. The low rates that sales teams experience converting leads to decisions clearly prove this. In fact, 60% of opportunities lead to a ‘no decision’ according to another study by CSO insights. Investing in “efficiency” technologies and processes to have more conversations, isn’t going to increase sales productivity. Not as long as we don’t work on the quality of those conversations. Better first invest in strategies focused on “effectiveness” to increase conversion. Once that is in place, we can still focus on efficiency. Our analysis shows over and over that more experienced sales are by far the majority of top quota carriers. They have had the time to learn and improve their competence. So the solution has to impact the ramp up time as well as the length of their tenure. And during that time, we need to improve knowledge sharing combined with a culture of continuous improvement. This will create the shortest time to experience, adaptive to changes in the marketplace. Is my sales process enabling sales management to coach people on doing the right thing at the right time? Do we have content adapted to each phase of the buying cycle AND to the different people (Buyer Persona) involved? Are we re-packaging marketing content for conversational use by the sales team? What is management actively doing to create a culture of knowledge sharing and continuous improvement? Is our sales training continuous, snackable and integrating skills, attitude and company specific messaging? The figures, based on a CSO insights study, are both aspirational and motivating to boost initiatives based on the 5 aforementioned questions. Talk to one of our experts and get custom and actionable input.